Called Gliese 581g, the planet was determined to be about three times the mass of Earth, meaning it was a rocky world, not a gas giant like Jupiter. Rocky extrasolar planets have been found before, but the unique trait about this planet was that it orbited within the red dwarf star?s habitable zone, that region of space where temperatures are sufficient for water to remain as a liquid on a planetary surface. Astrobiologists were thrilled at the news, since liquid water is considered necessary for the origin and evolution of life. In fact, NASA has made it a primary aim to ?follow the water? in the search for life elsewhere in the galaxy. "The fact that we were able to detect this planet so quickly and so nearby tells us that planets like this must be really common," said Steven Vogt in a statement announcing the discovery. Vogt is one of the lead astronomers of the Lick-Carnegie Exoplanet Survey, and lead author on the paper published in the Astrophysical Journal (and posted online at the arxiv.org web site). The paper also announced the discovery of planet 'f,' a 7-Earth mass planet with a 433-day orbit around Gliese 581. Planet 'g' was calculated to have an orbital period of only 37 days. Although an extremely close orbit by the standards of our own solar system, because Gliese 581 is not as luminous as our sun its habitable zone must be much closer in. To find the planet, the Lick-Carnegie team looked at 122 radial velocity measurements from the HIRES instrument on the Keck I telescope at the W.M. Keck Observatory in Hawaii. They also used 119 measurements from the HARPS instrument on the La Silla telescope at the European Southern Observatory in Chile. The HIRES measurements were taken over a period of 11 years, while the HARPS measurements were made over four years. Francesco Pepe, an astronomer who works on HARPS data at the Geneva Observatory, said at the IAU meeting this week that his team could not confirm the existence of Gliese 581g. In e-mail correspondence with Astrobiology Magazine, Pepe said that they could not confirm the existence of planet 'f' either. The Geneva team, led by Michel Mayor, announced in 2009 the discovery of planet ?e? in the Gliese 581 solar system. At approximately 1.9 Earth masses, this ?e? planet is the lowest mass extrasolar planet yet found, and has a 3.15-day orbital period around the star. "Since Mayor's announcement in 2009 of the lowest-mass planet Gliese 581e, we have gathered about 60 additional data points with the HARPS instrument for a total of 180 data points spanning 6.5 years of observations,? said Pepe. "From these data, we easily recover the four previously announced planets b, c, d, and e."
However, he said they do not see any evidence for planet 'g,' the fifth planet in the system as announced by Vogt and his team. "The reason for that is that, despite the extreme accuracy of the instrument and the many data points, the signal amplitude of this potential fifth planet is very low and basically at the level of the measurement noise,? said Pepe. By measuring the star?s movement in the sky, astronomers can figure out what sort of planets are orbiting it. Multi-planet systems create a complicated signal, and astronomers must tease out the spectral lines to figure out what represents a planet, and what is just "noise" ? shifts in the star light not caused by an orbiting planet. Astronomers have developed various ways to reduce such noise in their telescopic observations, but it still creates a level of uncertainty in detecting extrasolar planets. The Geneva team plugged the HARPS data on Gliese 581 into computer models to check on the odds the signal was the result of noise, rather than evidence of the habitable planet ?g? as claimed by the Lick-Carnegie team. "Simulations on the real data have shown that the probability that such a signal is just produced 'by chance' out of the noise is not negligible, of the order of several percents," Pepe said. "Under these conditions we cannot confirm the presence of the announced planet Gliese 581g." "We haven't made a detailed analysis yet, but at first glance no statistically significant signal [for planet f] is emerging from our data set," he said. Gliese 581 is already one of the most intriguing solar systems known, with four planets confirmed orbiting the star. 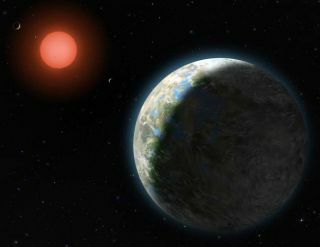 The addition of the potentially habitable planet 'g' would make the system the go-to place in the search for alien life, but more work needs to be done to either confirm or refute the planet?s existence. "I would say the detection was less than comfortably secure, even in the original Vogt et al. paper ? the paper was carefully worded, as opposed to what was in some media reports," said Ray Jayawardhana, a University of Toronto astronomer who was not involved in either study. "Of course, it's not easy to definitively rule out something, but the HARPS evidence is at least raising some doubts."